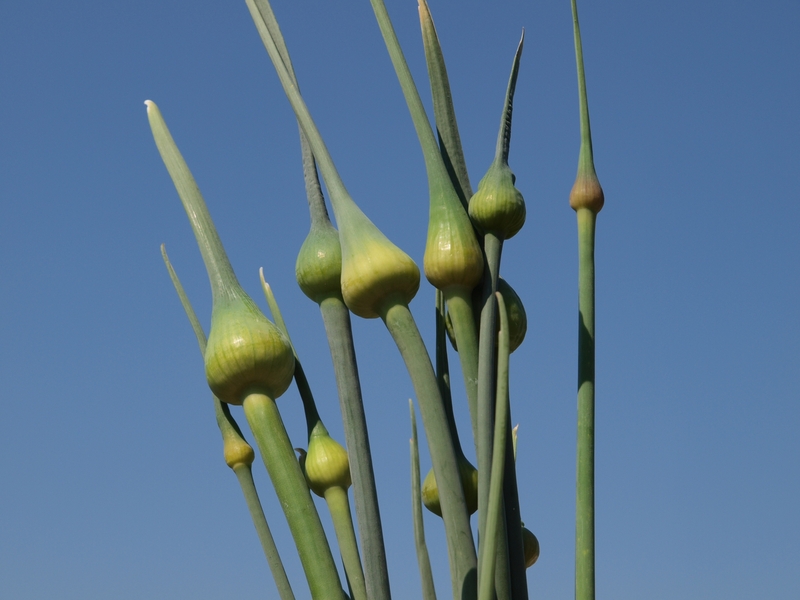 On my balcony the leek scapes are soaring high into the sky with their bulbous tops graciously resembling the architectural spires of Russian Orthodox Cathedrals. Everything on my balcony (leeks, tomatoes, strawberries, herbs and flowers) have been growing by leaps and bounds this week as it has been sunny and warm all week. Before they become too tough to eat, though, and take too much energy away from the root of the plant I decided to cut the scapes off and am going to make something tasty with them. 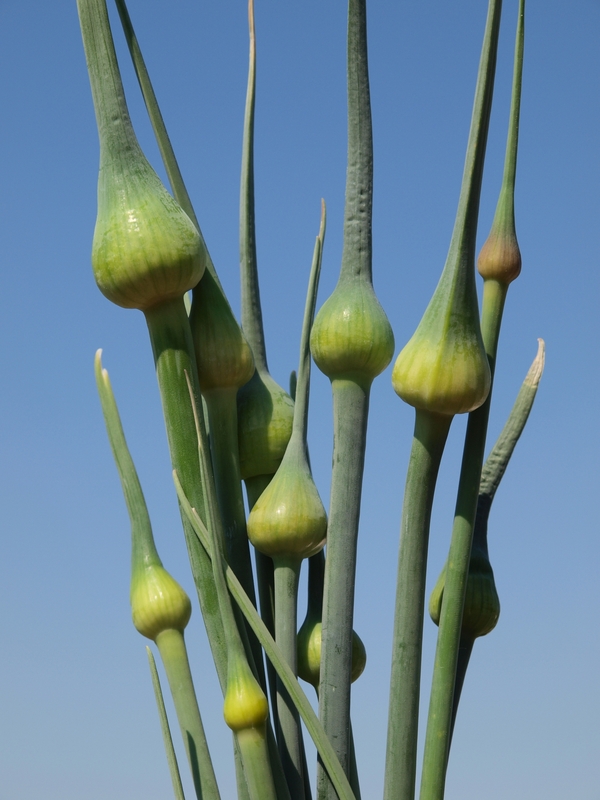 Leek scapes have a mild leek aroma and tender juicy stems, which closely resemble garlic scapes. They have an onion-like taste and their texture is very similar to asparagus. They are very tasty in soups, stir fries, pesto and pasta dishes but can also be eaten raw and in salads. Last year I made a delicious bean dip with our leek scapes after gently sauteing them in some olive oil. This weekend I am looking forward to adding them to a quiche and have already eaten some chopped up and steamed as a simple side dish. 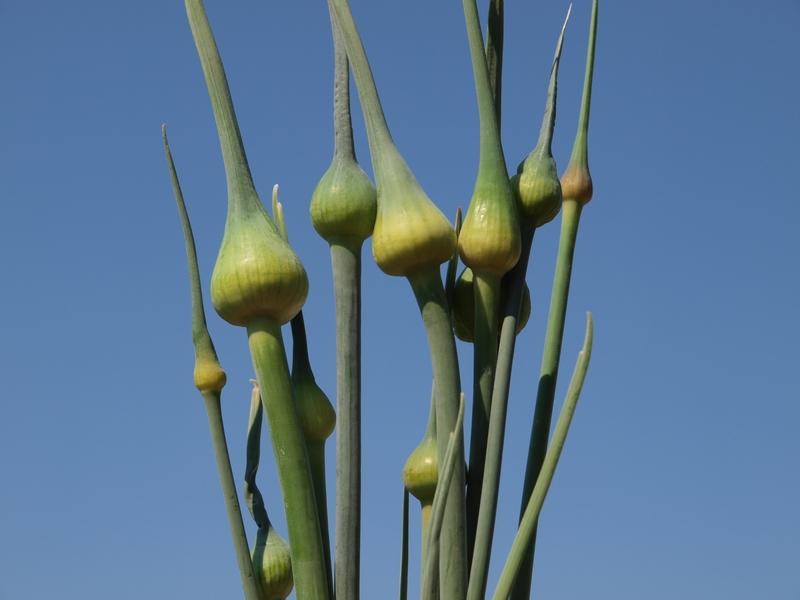 Make sure to use only the bulbs and tender stalks as the tough ones even after cooking can be tough and inedible. Preheat the oven to 350° F. In a frying pan heat the olive oil on med-high heat and saute the scapes until tender. In a large bowl add the eggs, creme fraiche and salt and pepper to taste. Beat together until well combined. Stir in the grated cheese. 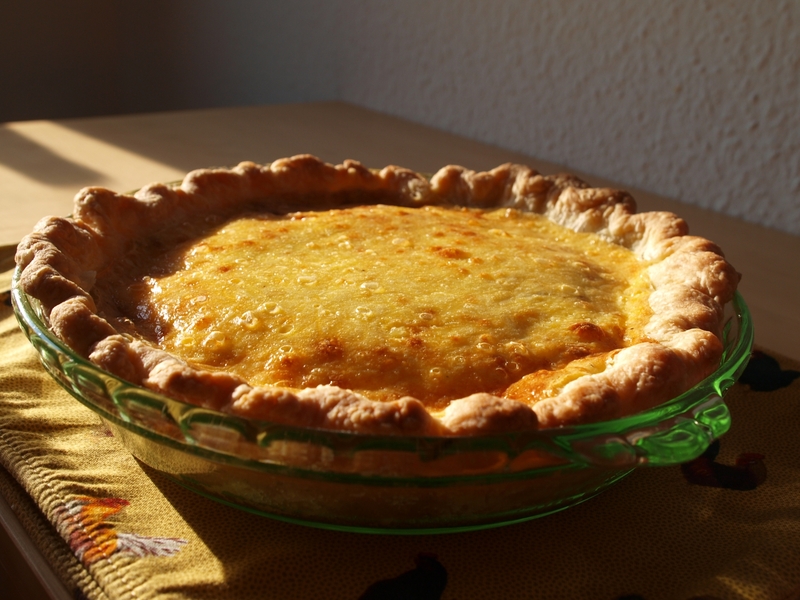 Prepare a nine inch pie plate with the single layer of pie dough and flute the edges. Spread the bottom of the crust with cream cheese until it is completely covered, being careful not to rip the crust (it helps if the cream cheese is soft when you do this). Spread out the scapes over the cream cheese (minus any extra oil from the pan) and add the ham or bacon if using. Pour the egg and cheese mixture on top. 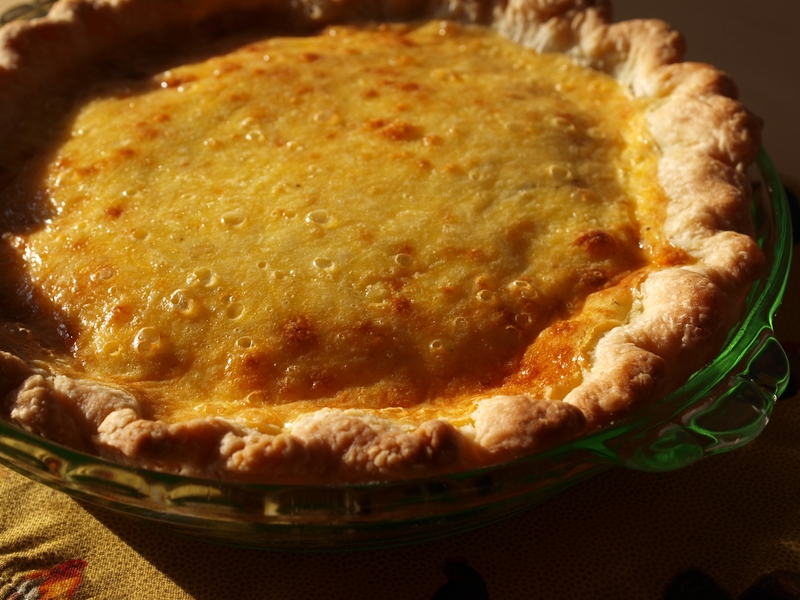 Bake for 50 to 60 minutes or until golden brown and is firm in the middle. Good afternoon, my name is “BOBBI” and I am the gal who created Bobbi’s Best Garlic Hummus in 1967. Thank you for your devotion to my product. I sold the business to my son in 2007. If you are interested in learning about me you can look me up on Facebook under… Bobbi Garlic Katz…My email address is: I would love to hear from you.THANK YOU! bobbi. Thank you for your comment. I do love Bobbi’s hummus, it’s the best! 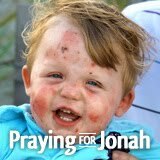 I hope you enjoy reading my blog. Sounds like your garden is doing very well. Thank heavens for a warm week! 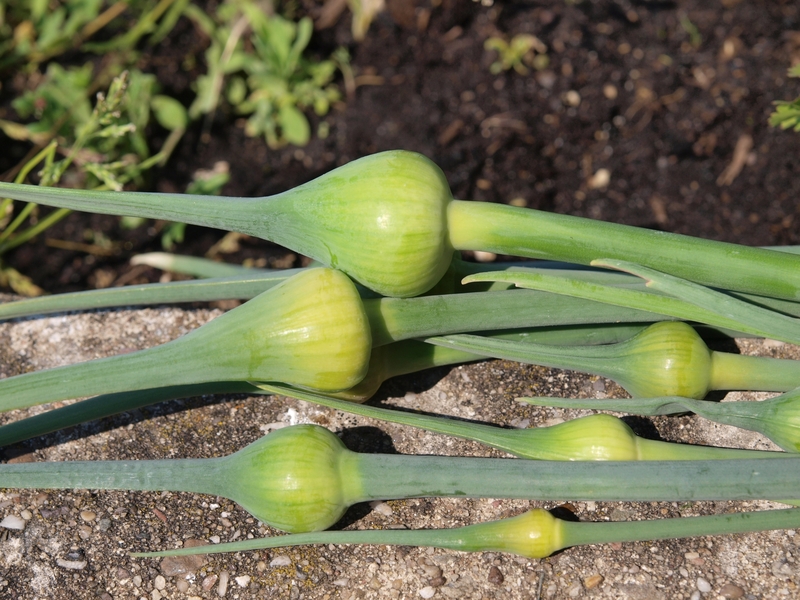 I hear and read so much of garlic scapes but never anything about leek scapes. This post and recipe were a revelation. Thank you for both, Laura. I hope this week is another warm one for you. Thanks, John. We have been lucky with the weather so far this month, lots of sun and just enough rain on and off that I haven’t had to go out and water the plants all that often. 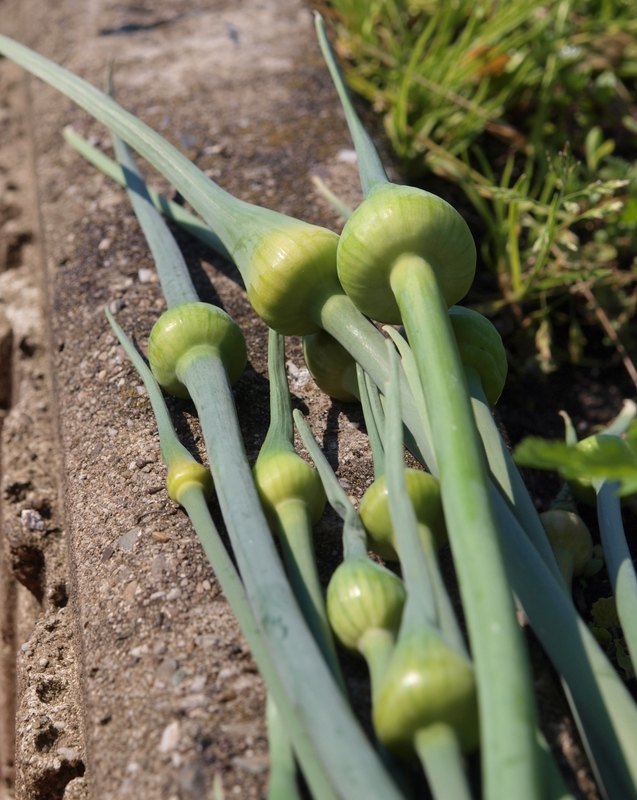 You should try scapes (garlic or leek) the next time you see them either at your local farmers market or if you grow your own. 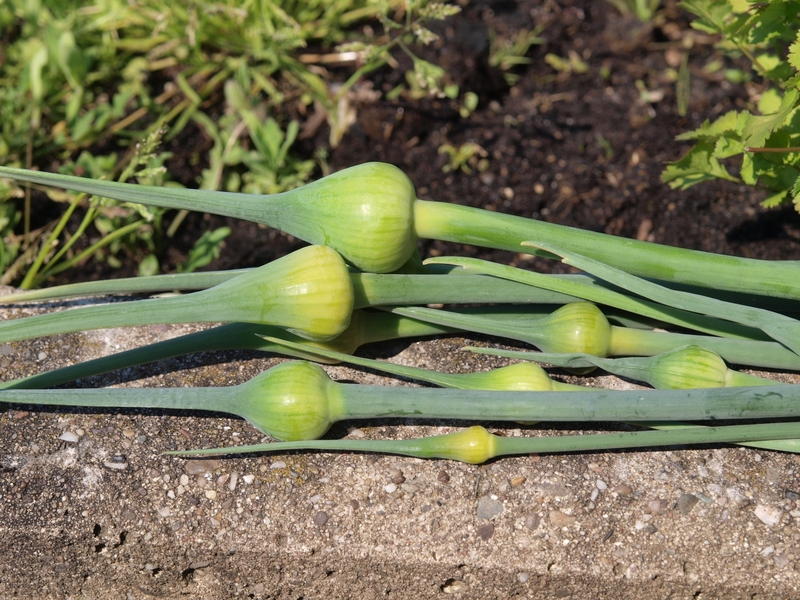 They are a great byproduct of one of my favorites in the onion family, garlic, but the leek scapes were very tasty too!